UN Photo/Elma Okic – The Human Rights Council chamber in Geneva. The UN Human Rights Commission says the “disproportionate and indiscriminate use of force by the Israeli occupying forces against Palestinian civilians” requires a full investigation. It’s about the people not the politicians. We got some women and children together and lit a candle to bring some light into this darkness of death. Our prayers go out to the injured, deceased and all their families and friends. He said Israeli soldiers killed 106 Palestinians, including 15 children, since March 30. More than 12,000 were injured, at least 3,500 by live ammunition. Israel was an occupying power under international law, obliged to protect the people of Gaza and ensure their welfare, he said. The United States which has supported the Israeli massacre of Palestinians on May 14 pommeled representatives to the UNHRC until 14 countries abstained including Germany, Japan, South Korea and the United Kingdom. Voting in favor of the decision were 29 states with two against. Australia and the US were the two countries to vote against the decision. Canada, which has no vote, spoke against the decision and shamed itself saying that the UN Human Rights Council was too biased against the human rights offender, Israel. Rosemary McCarney, Canada’s permanent representative to the United Nations in Geneva used the same logic (“[Canada can’t support the resolution because] “the resolution singles out Israel”) that has kept this conflict running for 70 years. More than that, the Canadian government betrayed Canadians who were shot during the May 2018 Gaza Massacre. She is probably right about both allegations. Her country’s government can make sure of that. But the war crimes investigation which may take as long as a year, may do more than just rattle the ambassador. The one thing she missed which the Human Rights Commissioner has been slamming with a figurative hammer, is the human rights of the two million people in Gaza. Hamas is equally guilty. “The unfortunate outcome of Monday’s riots can only be attributed to Hamas’s cynical exploitation of its own population, in a violent campaign against Israel,” she said. Aviva Raz Shechter brings a moot point to the discussion demonstrating more of the volatility of both Israeli and Hamas leadership bickering across a fence without a single care for the abused populations for which they are both responsible. It is no less true that Hamas’ conduct is exploitive of the people it should be helping instead of pushing vulnerable, unarmed civilians into harm’s way. We and civil society are concerned about the people, not the politicians. Nevertheless, as discussed below, The RINJ Foundation in a careful study of Gaza and other Palestine territories concluded in 2017 that Hamas and the Palestine Authority significantly exploit Palestine women and children. It is no less true the Israeli side is not justified to maim or kill these vulnerable, exploited people. The unmitigated drivel of Canada, Israel, America and Australia in their de facto support of the Israeli May 2018 Gaza Massacre is the same disingenuous weazling, waffling, piffel that has kept this ugly conflict alive for 70 years. A peaceful rally came hours ahead of an extraordinary summit meeting of the Organisation of Islamic Cooperation (OIC) also called by Erdogan to denounce Israel’s actions and the moving of the US embassy for Israel from Tel Aviv to Jerusalem. The OIC’s urgings are quite profound but sensible and should have been heard from the outset but the dysfunctional UN Security Council (UNSC) (dysfunctional because of its veto-powered five permanent members) failed the General Assembly of members miserably. The OIC called for upholding the UNSC’s legal obligations to defend the international law and order as they relate to Palestine and to put an end to these atrocities, and to provide international protection for the Palestinian people. The OIC said in its final communique that it wants international protection of the Palestinian population, including dispatching an international protection force. The United Nations General Assembly’s Committee on the Exercise of the Inalienable Rights of the Palestinian People condemns the excessive and disproportionate use of force by Israeli security forces against peaceful Palestinian demonstrators at the Gaza fence with Israel, in the context of the “Great March of Return”, which today alone resulted in the killing of 55 Palestinians and 2,771 injured. Since 30 March, the start of the six‑week campaign by Palestinians calling for their right of return in accordance with General Assembly resolution 194 (III) and the right to exercise their inalienable rights of self‑determination and independence, Israeli security forces have killed 110 and injured 12,271 Palestinians. The RINJ Foundation Women, a Civil Society women’s group based in Toronto, Ontario Canada has released several criticisms of Israel related to what the group calls the wrongful imprisonment of the sixteen-year-old Palestinian girl Ahed Tamimi. The group’s findings clearly indicate that the Palestine and Hamas leaderships are criminally exploiting vulnerable women and children to the point of their morbid endangerment. Repeatedly the risk is realized with casualties imposed on the population. Thus women and children in Palestine territories are unsafe. The RINJ group also claims it has learned about a silent edict which has been issued to Israeli Occupation Forces in the Israeli occupied Palestinian settlements of the West Bank to conduct reprisals on women and children for the ongoing demonstrations against Donald Trump’s announcement that the US is declaring Jerusalem as the Capital of Israel and moving its embassy there. The nation state of Israel has absolute power over the Palestinians since 1967. In recent years, if not for longer, it has come to abuse its power over the Palestinians systemically and with an apparent air of impunity. Friends of Israel must warn the State that it has gone too far in targeting women and children for abuse. Instructing soldiers to shoot their live ammunition at the legs of demonstrators, killing thirty women and over fifteen children since March 30 is a crime for which Israeli’s who are responsible must pay in prison time. In the West, journalists and politicians have dismissed Palestinian claims of human rights abuses in the Israeli Occupied Territories, for decades. Today these people have a UN Human Rights Commissioner who is fighting for their safety. 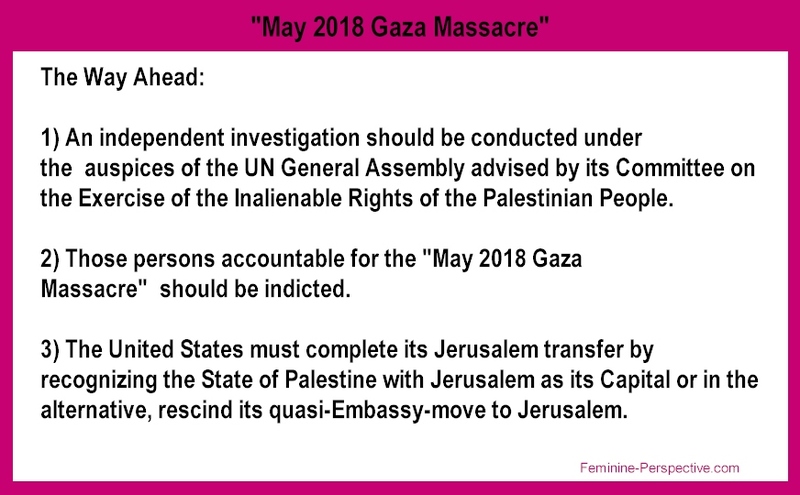 Feminine Perspective last week blamed the US and Israel then pulled back and urged for an independent investigation into the May 2018 Gaza Massacre. A small few others did that as well to the chagrin of the United States, many of America’s trading partners, and of course Israel. Evaluating decades of suffering by Palestine women and children, The RINJ Foundation advanced as a civil society women’s group that Women and Children are not safe in Gaza. There is an enormous amount of concurrence to that finding. UN High Commissioner for Human Rights Zeid Ra’ad Al Hussein said Friday in Geneva that Palestinians are ‘caged in a toxic slum’ in Gaza. 1. Abusing Palestinians is accepted Israeli way of life. 2. America, from the President down hates Muslims and manipulates Israeli government policy in that channel. 3. The Palestinians have a one track methodology these past seventy years: bloody revolt. Hence, those persons found to be responsible with probable cause, on any and all sides, for the May 2018 Gaza Massacre should be indicted. You might think that calling this crisis a May 2018 Gaza Massacre assumes a conclusion. It doesn’t. We were there. This was a massacre for which my God damned its perpetrators with a deep-looking UN investigation. Prayers from around the world must have been, “make this stop”. Since the Palestinian demonstrations began March 30, more than 110 Palestinians were killed and more than 2,500 wounded by live military gun fire, according to the Gaza Health Ministry. Palestinian officials claim most of the casualties have been unarmed protesters. One Israeli soldier has been wounded. On May 14, Palestine Authorities estimate that some 40,000 Palestinians took part in the demonstrations because this was the day that Donald Trump invoked the 1995 congressional Jerusalem Act and in a technicality (The actual ’embassy’ remains in Tel Aviv and will take years to move.) transferred the US Embassy to Jerusalem. Then began the May 2018 Gaza Massacre. The Israeli military used live NATO standard ammunition and shot the legs of thousands of Palestinians, under orders. IDF soldiers who will not be named told me exactly that. They were under orders. Do you know Gaza? It’s a human dump of the unwanted. The Gaza Strip is a 365 square kilometre concentration camp surrounded by razor wire housing 2 million people. It is a nightmare for human rights workers and the most crowded and uninhabitable place next to America’s Guantanamo Bay. The Humanitarian Coordinator, Mr. Jamie McGoldrick, today called for the protection of Palestinians, particularly children and health workers, in the context of demonstrations taking place in the occupied Palestinian territory (oPt) and for demonstrators to refrain from actions that prevent the functioning of the main entry point for humanitarian goods to the Gaza Strip. Today, the Humanitarian Fund for the occupied Palestinian territory (oPt HF) announced the release of US$ 2.2 million to address urgent humanitarian needs resulting from the massive rise in Palestinian casualties in the Gaza Strip. Today, the Humanitarian Coordinator, Mr. Jamie McGoldrick, and the UNRWA Director of Operations in the West Bank, Mr. Scott Anderson, joined Palestinian officials in a visit to the Palestinian Bedouin community of Khan al Ahmar-Abu al Helu, on the outskirts of East Jerusalem in the occupied Palestinian territory. Joint press release, Gaza: Today, the Minister of Social Development of the State of Palestine, H.E. Dr. Ibrahim Al-Shaer, and the Humanitarian Coordinator, Mr. Jamie McGoldrick, launched the Humanitarian Response Plan (HRP) for 2018, to support the humanitarian needs of 1.9 million Palestinians in the occupied Palestinian territory (oPt). Funding is desperately needed for emergency fuel: Emergency fuel for critical facilities in Gaza will become exhausted within the next ten days, the United Nations warned today, noting an urgent need for donor support to avoid a humanitarian catastrophe driven by the energy crisis. I am deeply concerned by the Israeli authorities’ demolition this morning of two donor-funded classrooms (3rd and 4th grade), serving 26 Palestinian school children in the Bedouin and refugee community of Abu Nuwar, located in Area C on the outskirts of Jerusalem. The demolition was carried out on grounds of lack of Israeli-issued permits, which are nearly impossible to obtain. This was not “a PR victory for Hamas”, in the reported words of a senior Israeli military spokesman; it was a tragedy for thousands of families. The Israeli Prime Minister, Benjamin Netanyahu, has also described the demonstrators as being “paid by Hamas”, and has said the Israeli security forces “try to minimize casualties”. But there is little evidence of any attempt to minimize casualties on Monday. Although some of the demonstrators threw Molotov cocktails, used sling-shots to throw stones, flew burning kites into Israel, and attempted to use wire-cutters against the two fences between Gaza and Israel, these actions alone do not appear to constitute the imminent threat to life or deadly injury which could justify the use of lethal force. The stark contrast in casualties on both sides is also suggestive of a wholly disproportionate response: on Monday, on the Israeli side, one soldier was reportedly wounded, slightly, by a stone. Killings resulting from the unlawful use of force by an occupying power may also constitute “wilful killings” – a grave breach of the Fourth Geneva Convention. The human rights situation in the occupied Palestinian territory continues to deteriorate. Settlement building continues, and settler violence has again been rising this year. Demolitions of private property continue, including punitive demolitions, which constitute a deplorable form of collective punishment. The small Bedouin community of Khan al Ahmar, just east of Jerusalem, is at high risk of forcible transfer. This week, the villages of Beita and Nabi Saleh were subjected to closures and restrictions on movement following clashes with the Israeli forces. Israel also continues to detain large numbers of Palestinians, including children, although under international law the detention of a child must be a measure of last resort. I also deplore the widespread and unprincipled use of detention without trial – described as “administrative detention” – and violations of fundamental fair trial guarantees. And the deficit in accountability for alleged extrajudicial killings and other violations, as previously reported by the Secretary General and my Office1, undermines confidence in Israeli justice. I urge Israel to act in accordance with its international obligations. Palestinians’ right to life, their right to security of the person and rights to freedom of assembly and expression must be respected and protected. All individuals’ right to health must be respected and protected, regardless of the context in which they may have been injured. The rules of engagement for Israel’s security forces must be in line with Israel’s international obligations, and I urge that they be published.Children should never be the targets of violence and must not be put at risk of violence or encouraged to participate in violence. I again remind all concerned that lethal force may only be used in cases of extreme necessity, as a last resort, in response to an imminent threat of death or risk of serious injury. Following are UN Secretary-General António Guterres’ remarks, delivered by Chef de Cabinet Maria Luiza Ribeiro Viotti, to the Security Council open debate “Upholding international law within the context of the maintenance of international peace and security”, in New York on Thursday. I thank the Government of Poland for organizing this important debate on the role of the Security Council in upholding international law. International law is foundational to this organization and the Security Council has a special role to play in ensuring that it is respected. I welcome Poland’s suggestion that today’s debate pay special attention to promoting the peaceful settlement of disputes and the Council’s involvement in that process. The Charter of the United Nations does not prescribe the use of any particular means of settlement for disputes between Member States, nor does it establish any particular hierarchy among them. Member States are free to choose between negotiation, enquiry, mediation, conciliation, arbitration, judicial settlement, resort to regional agencies or arrangements, or other peaceful means of their choice. The Security Council, for its part, has many options. It can call on States to settle their disputes and draw their attention to the means that are available to them. It can recommend to States that they use a particular means of settlement — a power the Council has rarely employed. The Council can support States in using the means they have chosen. It can support the initiatives of States and other international organizations, institutions or people that try to assist States in resolving their differences. The Council can also task the Secretary-General to try to assist States to reach a settlement, or even establish a subsidiary organ for that purpose — again, a power that, since its early years, it has not often employed. And where States have agreed to use the International Court of Justice, there is a role the Council may play in ensuring that the Court’s judgment is properly observed. Allow me to use this opportunity to call on Member States to consider accepting the Court’s compulsory jurisdiction. Let me turn now to another issue of relevance to today’s discussion: accountability for international crimes. Through its resolutions establishing the International Tribunals for the former Yugoslavia, in 1993, and for Rwanda, in 1994, the Security Council has had an undeniable impact on international law. The two tribunals have laid the groundwork for the development of international criminal law — a field that barely existed before. At the same time, the Council advanced the interpretation of the Charter and of its own functions, acknowledging the close link between international criminal justice and the purposes of the United Nations. The advancement of international criminal justice therefore falls within the scope of the Security Council’s responsibility for the maintenance of international peace and security. The Security Council was also involved in the establishment of the Special Court for Sierra Leone and the Special Tribunal for Lebanon. But the Security Council’s role in the fight against impunity has gone beyond creating tribunals. In the Central African Republic, it mandated the United Nations peacekeeping operation, MINUSCA, to support the Special Criminal Court, a national court established by national law. The Council has also requested the Secretariat to work closely with the African Union Commission in support of efforts to establish the Hybrid Court for South Sudan. Moreover, in those cases where it is difficult to foresee the establishment of effective accountability mechanisms in the immediate future, there is increasing momentum for gathering and securing evidence for use in national, regional or international courts that may in the future have jurisdiction over relevant crimes. In the case of Iraq, the Council unanimously adopted resolution 2379 (2017), which established an independent investigative team to support domestic efforts to hold Da’esh accountable for its actions in Iraq. The Secretariat has been working closely with the Government of Iraq and other key stakeholders to operationalize this important mechanism. International criminal accountability is still a relatively new area of work for the United Nations, but it is already clear that there is room for improvements in three specific areas. First, the Security Council needs to be the driving force to ensure that international humanitarian law, international human rights law and other relevant rules, norms and standards are fully included in any accountability process. Second, these institutions need sustainable funding. Yet even as the international community considers creating new institutions, funding for some of the existing hybrid institutions has largely dried up, putting at risk gains of judicial efforts. Third, effective accountability requires the constructive engagement of the international community. I encourage Member States to engage with the Secretariat during the process of establishing or supporting accountability mechanisms to help ensure that the framework for the establishment of any mechanism conform with applicable United Nations standards and policies. The Security Council has played a critical role in upholding international law, supporting the peaceful settlement of disputes and advancing the fight against impunity. Against a backdrop of grave threats and growing turmoil in many regions, the unity of this body and the serious commitment of the entire international community will be crucial in preventing human suffering and defending our common humanity. The Secretariat stands ready to support these efforts.